brings the powerful beast into view. the sight of him brings me closer to you. 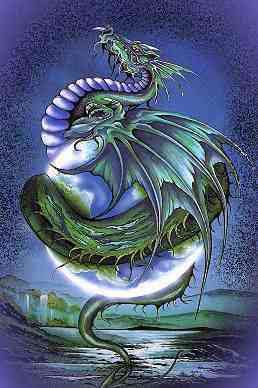 Dragons symbolize power, the grace of flight, the protection of a guardian, and an endurance of life to me. Battles with dragons may represent the things that need to be destroyed in your life. Smoking, drinking, drug-use, or any destructive behavior may be the dragon that you must slay. However, keep in mind that not all dragons should be slain! For dragons are often guarding treasures, rubies, jewels, even sleeping on beds of gold coins. These treasures symbolize knowledge and wisdom and your dragon-spirit can reveal much knowledge to you, for knowledge is power indeed. Many tales speak of a fair maiden held captive by a dragon with many good knights questing to rescue her. The maiden guarded by the dragon represents many ideas, truth, wisdom, peace after conflict, goals achieved, the reward of good heath after kicking a bad habit, and to some ancient traditions - the Goddess! Dragons are associated with fire. Fire creates light, illumination, heat, and destruction, therefore fire is the element of change. Nothing purifies like fire. The strongest metals are made from it and so are the strongest people. Fire in its destructive form, destroys the outdated and obsolete so new changes can grow. A forest is reborn after a fire and the grass is greener because of the nutrients left in the soil from the ashes. The dragon's lesson for us is truth. The dragon reminds us to stand up for the truth even if the whole world says you're wrong. You will need the strength of the dragon to accomplish your goal. Which reminds me of another old saying, "The truth may not make you any friends, but it sure does influence people." How do you see dragons? In the heavy smoke of a fire. soundlessly .. softly .. with a surety of soul. I smell his presence and smile, knowing what is to come. Lowering my chin, I offer my neck to be touched ..
of feather touch as they dance across my skin. I feel his breath against my skin .. warm .. alive ..
at the nape of my neck bent in utter trust. with hands made muscled by years of labor. from the tortures of the day .. surely as the sun ..
strong sensual strokes down the length of my back. slowly, across my chest to loosen my dress. Unveiling silky skin unblemished by the sun ..
of sensual pleasures yet to come. leaving small trails of raised skin .. a quivering ..
building deep within the mound of my belly. With a kiss .. the fire is kindled and spreads ..
awakening the beast residing deep within ..
the animal that drives the soul and demands to be fed. Heat from the dragon within .. builds and grows ..
overwhelming the soul .. overpowering the mind ..
rousing the beast who demands satisfaction. Tender touches .. light and sure ..
dancing across the thighs .. teasing .. touching ..
luring the beast from the lair. fusing the soul with the body .. fiery .. scorching ..
unadulterated ecstasy within the essence of my being. slowly extinguish the fire of the beast within ..
allowing me to drift into sweet and blissful sleep. a cosmic cross in a velvet sky. with coiling wraps of mighty tail. to light the way for others lost. suppressed by greed and darkened thoughts. to grow and move freely about. if love and truth are not acclaimed. as she hangs her head in agony. destruction reigns so truth stays free. and cleanses the world with fiery jaws. beginning new lives of serenity. for allowing me to use a picture of your sculpture to make this background. This dragon is an incense burner. for the information on dragons.